Medical education and the tools used for assessment are continually evolving. Single Best Answer (SBA) questions are a relatively new method of assessment commonly encountered in final surgical exams. The key to success in any SBA-style examination is practice, practice and more practice. 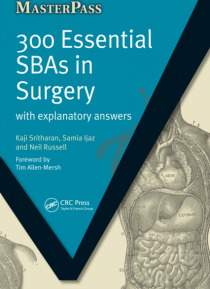 With nearly 300 structured questions, this book comprehensively covers the surgical curriculum. Each specialt… y-specific chapter contains a combination of clinical vignettes and knowledge-based questions of varying degrees of difficulty, both challenging the more able candidates as well as giving a realistic appreciation of the standard required to pass. Each question gives a detailed explanation of the correct answer to aid reflection and reinforce understanding. This book is the ideal revision aid for all undergraduate medical students preparing for their final examination in surgery. In addition, doctors studying for the Membership of the Royal College of Surgeons (MRCS) and the Professional and Linguistic Assessment Board (PLAB) examinations will also find this book extremely useful.